New Yorker Joseph Boroski is one of Asia’s most acclaimed bartenders and consultants in addition to operating a bartending school in Bangkok. Drinks World caught up with Joseph to talk about his latest venture, J Boroski - a venue that brings one of the most enigmatic and creative cocktail spaces to Hong Kong with a cocktail concierge service. 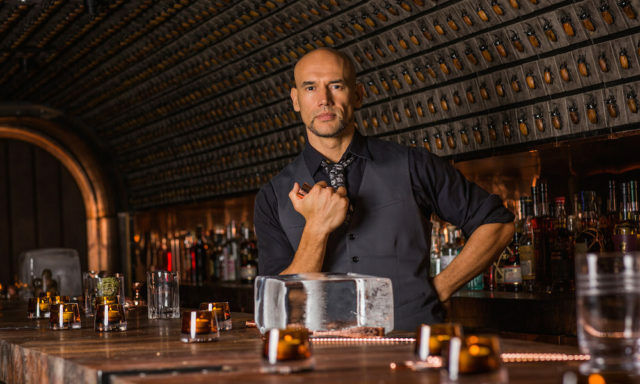 New Yorker Joseph Boroski is one of Asia’s most acclaimed bartenders and consultants in addition to operating a bartending school in Bangkok. Drinks World caught up with Joseph to talk about his latest venture, J Boroski – a venue that brings one of the most enigmatic and creative cocktail spaces to Hong Kong with a cocktail concierge service. DRINKS WORLD: You hail from New York, how did you end up in Asia, what brought you specifically to Hong Kong? JOSEPH BOROSKI: I was doing a bunch of cocktail pairings with some famous chefs in America for some events around the country and one of the organisers was actually based in Asia, specifically Bangkok at the time. They were setting up kind of a tour with some of the chefs I was working with and asked me to join the tour to pair some cocktails with the chefs. I said “Sure”, so I ended up coming out to Asia and doing the tour. Afterwards, I ended up getting a lot of enquiries about coming back to a lot of the venues we were working at to do some training with the staff that was there and to refresh their menu, so I ended up getting a lot of consulting jobs through that. I was flying back and forth from New York and I ended up realising that it would be better if I had a base in Asia. DW: Is a concierge service for drinks something that you have experienced in other bars or cities? JB: Not specifically what we’re doing at J. Boroski. It is derived from some experiences that I’ve had before, but it’s also derived from some ideas that I had to make things a little bit more original and unique. I wanted to make sure that what I was offering was going to be something that people wouldn’t come across generally, and I think it’s still pretty hard pressed for anyone to have the same kind of experience anywhere. Part of the cocktail concierge service is being able to create something for someone based on his or her preferences. And we go in one of two directions with that; we ask the guest if they would prefer something more spirit forward, which would be your chosen spirit enhanced with other additional ingredients, or something more fresh based, which would be made using several of our freshly prepared ingredients that would be backed up by your chosen spirit or we can choose the spirit if guests would like us to. They’re essentially the two types of drinks that we do. DW: Why did you choose Hong Kong as a location to do a concierge service venue? JB: I decided that Hong Kong would be an exceptional spot for this concept because the people of Hong Kong, for quite some time now, are familiar with luxurious and exceptional service. There are a lot of luxury brands here and great style and fashion as well. The guests that I am actually getting are people that appreciate good quality things and luckily I am seeing that and that’s why I think Hong Kong works really well for this kind of an idea. DW: How has the response to J. Boroski been thus far? JB: Thankfully, it’s been really good. I’ve received some really amazing personal emails and feedback from people that have come in saying, “Wow, this is really great, I’m glad that you’re doing this and I’m glad there’s people really kind of thinking outside of the box and making an experience that’s not as familiar as most are”. There are some really great spots in Hong Kong that are opening and definitely some key players in the industry that are turning things on its head. I’ve been getting a great response and I’m happy to hear that people love it, so I hope it will continue. DW: With J Boroski creating cocktails to the tastes of guests, how does the preparation and service differ, in your opinion, to a traditional cocktail bar? JB: I like to refer to J. Boroski as a “Creative cocktail space”. In fact I tell the team to not use the word bar unless we’re specifically talking about the bar itself in the space, because to me it’s more of an “anti-bar” – a friend of mine coined that term and I just grabbed onto it. It really is something that is different than what you normally get in a bar. With this concept, you’re not looking at something and trying to compare this and that. So what we do, in some ways, is eliminate the choice and then we add a much greater selection. So it’s going in two different directions in that way and it’s really something quite different. It’s definitely something that I think most people in Hong Kong have not imagined before. DW: Do you see this as the future of cocktails bars, where bartenders tailor drinks to the taste of each individual guest, rather than offering a menu or list of drinks? JB: I think it very well can be, I haven’t actually thought of that as something that could take off. Considering that there are exponentially more career bartenders and the bartenders are really focused on doing the best job they can at making the best possible product, I think that it can be very likely that it will happen more and more. The more that people can trust the bartender to create something for them, the more I think that will happen and that can also be a part of the regular offering at bars, regardless of whether they have a menu or not. Whether that’s the future of cocktail bars, maybe but I couldn’t really say. DW: In addition to operating bars and being a mixology consultant, you have a bar and hospitality school. How are you managing your time these days, and where are you spending most of your time? JB: Haha, the answer to that question can change on a regular basis. I’m spending half of my time in Hong Kong, so I’m committed to really making sure that the venue is going really well, that the team is really progressing, and that people are continuing to have a really original and great experience here. Beyond that I do, as mentioned, have a school in Bangkok. My main business continues to be consulting with other venues, groups, brands and hotels. I do have quite a lot projects going until the end of the year, and into next year as well. The only difference now is that I’m a little more grounded because I am in one spot for half of my time, which I’d say a couple of years ago was not the case.